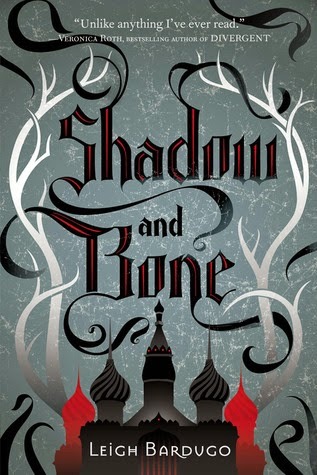 Shadow and Bone, a Russian-inspired fantasy novel from debut author Leigh Bardugo, tells the story of Alina Starkov, an orphan living an ordinary life as a cartographer's assistant. Desperately in love with her best friend, Malyen Oretsev, another orphan whom she has known for most of her life, Alina longs to be noticed as a woman by him. When catastrophe strikes and puts the lives of all she holds dear in danger, a powerful magic begins to spill forth from her, chasing out the blackness that threatened to engulf her and her friends. However, with this new-found power comes new-found responsibility. Almost immediately after her power manifests, Alina is swept up into a world of politics and intrigue that she couldn't possibly have hoped to understand before. The Darkling, the enigmatic and handsome leader of the Grisha, promises to protect her and tells her of his plan to have her forge an amplifier from the antler of the stag from Morozova’s herd. Not everything in the palace is as it seems, and Alina must navigate her way through a bevy of people whose only interest in her is the power that she could harness and others who want to hurt her because of it. The hardest part of Alina's journey may well be figuring out just who to give her trust to. The Russian elements added to the story help to keep the standard fantasy storyline fresh and interesting. Alina is an extremely relatable character, it's easy to put yourself into her shoes and understand why she makes the decisions that she does. Her heart longs for Mal, who she had to leave behind to start her journey, and The Darkling tries his best to fill that void for her. Mal's character is a bit one note, though he is not given much story-time to really shine or grow. Shadow and Bone is fairly fast-paced and the twists are enough to keep you on your toes while reading. Easily one of the better fantasy books out there for young adults, and a shouldn't miss for fans of the genre. The sequel, Siege and Storm is already released. The final book in the trilogy, Ruin and Rising, will be released June 17th of this year. Similar Books: Girl of Fire and Thorns by Rae Carson, Throne of Glass by Sarah J Maas, Touch of Power by Maria Snyder. 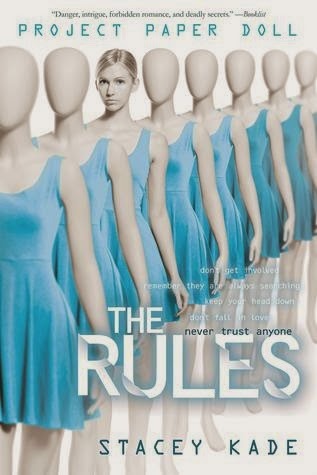 The Rules, book one in the Project Paper Dolls series by Stacey Kade, is a science fiction young adult novel told in the alternating perspective of Ariane Tucker and Zane Bradshaw. Ariane has lived the majority of her life following the rules set for her by her "father", the man who rescued her from the lab in which she was created. Posing as his daughter who had lost her battle with cancer shortly before she was rescued from the lab, Ariane has done her best to go unnoticed by the world at large. Zane Bradshaw on the other hand, is the epitome of noticed. His good looks and lofty social status are hard to miss, but his heart just isn't in the popular scene anymore. After his mother is suddenly out of the picture, he questions the role that he is expected to play, especially when that role involves hurting someone that intrigues him as much as Ariane Tucker. Past the two main leads, much of the cast is inconsequential. There is of course Ariane's best friend, Jenna; a queen bee wannabee who has aspirations of climbing the social ladder, no matter who she has to step on to get there. And then the actual Queen Bee, Rachel who is sociopathic in her desire to maintain the social order. The Rules could easily just blend in with all of the other high school dramas that litter the book store shelves, but Stacey Kade's writing is genuinely funny and peppered with enough nerdy references to science fiction greats that it is worth the cliched upper/lower class high school struggle. With the added tension from Ariane's struggle to stay off the radar of the company that is trying to reacquire her and a twist or two tossed in for good measure, The Rules is a worthy addition to any shelf. Project Paper Doll book 2, The Hunt, was released last week. No word yet on a title for book 3, or when it might be released. Similar Books: Reboot by Amy Tintera, I Am Number Four by Pittacus Lore, Eve & Adam by Michael Grant, Beta by Rachel Cohn. The first book in a new series by Jennifer Lynne Barnes, The Naturals is reminiscent of crime shows such as Criminal Minds or Sherlock. Except, instead of seasoned adult profilers, the cast is made up of emotionally scarred teens. Cassie Hobbes is the protagonist, and she isn't your typical teenager. Her mother, a scam artist who masqueraded as a psychic, helped her to develop her natural ability of reading people, to the point where she can tell you almost anything you need to know about a person before they ever open their mouth. When her mother goes missing, she is forced onto a family she had never met and with whom she can't quite connect with. Cassie catches the eye of an FBI agent who wants to recruit her for his Naturals program, a group of teens with extraordinary abilities much like Cassie's. Feeling like a burden on her new family, she decides to take him up on his offer and move into the house with the other Naturals. At her new home Cassie meets a cast of characters, each one more bizarre than the next. First, there is Michael, a cute boy who has the ability to read emotions from anyone, no matter how skillfully they try to cover them. Then there is Dean, whose talents mirror her own, but his aloof attitude scares most people off. Sloane, a young girl with a seeming eidetic and an addiction to coffee, is the resident kleptomaniac. And then there is Lia, a human lie detector who is incredibly skilled at spinning her own lies. Cassie has to figure out how to navigate this new world and the people in it if she wants to be a part of te new program and have a shot at finding out what happened to her mother. 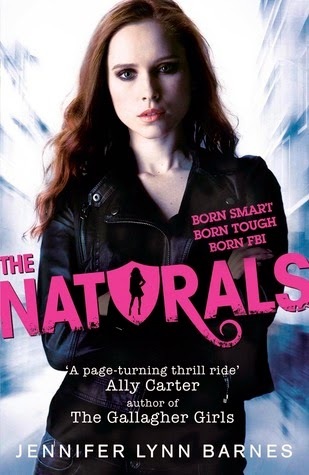 When a serial killer shows up and the clues all start to point to Cassie being involved somehow, the Naturals have to band together to keep each other alive and put away the dangerous killer. The storyline for The Naturals is fun and very fast-paced, and there are plenty of twists to keep you guessing until the end. The characters have a great chemistry with each other, and it's interesting to watch their camaraderie grow and change as the story goes along. Romance-wise, there is quite a bit to be desired. As this is the first book in a series, the Cassie/Dean/Michael love triangle was nowhere near settled. In fact, the romance seems to take center stage in all of the kid's discussions over the matter, but the romantic plot hardly advances any at all. All in all, this is a quick read, something fun that might surprise you in the end. Hopefully the second book picks up the same fast-paced and mysterious thread and runs with it. The sequel, Killer Instinct, is set to be released on November 4, 2014. Similar Books: Confessions of a Murder Suspect by James Patterson, Heist Society by Ally Carter, Hunting Lila by Sarah Alderson. The first book in the Starbound Trilogy, These Broken Stars tells the story of Lilac LaRoux, a debutante heiress to the largest fortune in the universe, and Tarver Merendsen, a war hero with nothing to his name. Both are passengers on a luxury spaceship when catastrophe strikes and the ship is pulled out of orbit unexpectedly. Stuck in the same escape pod, Lilac and Tarver find themselves stranded on a seemingly-abandoned planet with nothing but each other to rely on. These Broken Stars is filled with vivid imagery, told in the alternating perspectives of Lilac and Tarver. The chapters are interspersed with glimpses into the future, where Tarver is being questioned by an unknown individual regarding his time on the planet with Lilac. Lilac plays the role of useless debutante almost to a T from the very beginning. While it is clear that she is an intelligent person, her real world inexperience, or rather her lack thereof, is a hindrance to their attempts to survive on the foreign planet. She whines a lot, and at times you almost wish Tarver would just leave her behind. Luckily, her whining and incompetence subside eventually and you are left with a person whose strength is allowed to shine and who is willing to make hard choices to help someone else survive. Tarver, on the other hand, is practically made for this type of catastrophe. His ability to cajole Lilac into compliance, and wheedle her into doing what is necessary is unparalleled. His past as a soldier is an invaluable tool in their arsenal and is undeniably the driving force behind their survival. The storyline is solid, though it admittedly did drag in a few spots. 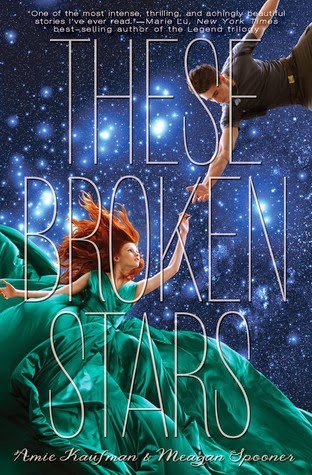 Science Fiction for young adults has seen a resurgence in popularity in recent months, and These Broken Stars is a great place to start for new readers of the genre. There is plenty of romance mixed in with a heaping dash of mystery and a smidge of action. It doesn't focus on the technical aspect of science fiction that have so many readers wary of the genre, and the alternating perspectives keep the story from getting too stale. Starbound is a companion trilogy, so These Broken Stars is self-contained, though it is almost guaranteed that you will want more of Tarver and Lilac once you reach the end. All in all, it is a fairly fast-paced romp and the romance will not disappoint. The sequel, This Shattered World, is due out in hardcover November 11, 2014. Similar Books: Under the Never Sky by Veronica Rossi, Glow by Amy Kathleen Ryan, Across the Universe by Beth Revis.